Pete-N-Poke Sport .40 Nostalgic Airplane. a stall, it loses very little altitude before quickly recovering. taildragger pilots can quickly master takeoffs and landings. access to on-board radio gear and the fuel tank. built-in so no separate mount is required. 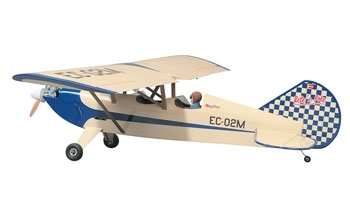 INCLUDES: All the wood to build the kit, 3/16" main landing gear wire, 3/32"
instructions, full-size rolled plans, decals. COMMENTS: Pictured on box with Sapphire Blue and Cream MonoKote trim scheme. squares ironed in place to form the checkerboard pattern.